Continuing the jitney-related theme of last month’s posts, let’s explore the history of jitneys in song. "He packed them on the fenders/ And he packed 'em on the hood;" Sheet music for Mister Whitney's Little Jitney Bus. “Jitneys,” named after the slang term for a nickel, got their start in late 1914 in Los Angeles, where down-on-their-luck auto owners first got the idea of driving along street car routes, giving rides for the same 5-cent price as the streetcar. The idea caught on quickly due to a rise in unemployment that came with the beginning of World War One. 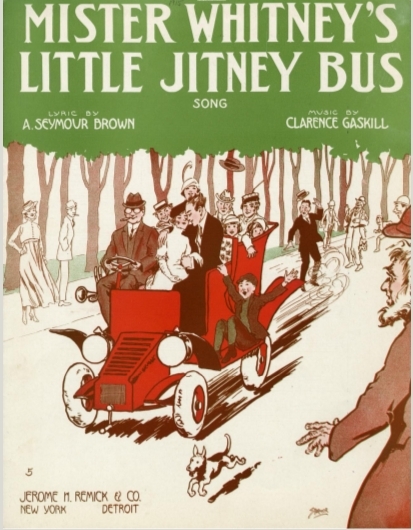 The “jitney craze” was matched by a slew of songs giving voice to the excitement, romance, and frustration of the early jitneys. He lost near all he had. And that was all that he had left upon the fatal day. Dear mother is renting a "Can't Af-Ford"
The car would stop at each saloon. When you’re out in a jitney affair. And the other dozen stood. Prudes of the day worried that jitneys promoted immoral behavior, so it is perhaps fitting that, in the song, Gasoline Gus ends up in Hell, where he elopes with the Devil’s wife. And let him ride my imps about." He was making love to the devil's wife. Come on and hop a Jitney with me! I didn’t raise my Ford to be a jitney! Waiting to take your fare. But outside the dwindling number of cities in which jitneys still plied for hire, the jitney bus was being forgotten. By the time the teenage newlyweds in Chuck Berry’s 1964 “You Never Can Tell,” buy “a souped-up jitney, a cherry red '53,” the word “jitney” just means an old car.